Many years ago, I was delighted to buy a second-hand copy of The Day the World Ended by Gordon Thomas and Max Morgan Witts. In those days it was hard to find a good account in English of Mt Pelee’s massive eruption on May 8th 1902 that destroyed the city of St. Pierre on the island of Martinique . Nowadays, With Amazon.com, it is much easier, and since I had given away my copy, I bought another, and along with it Ernest Zebrowski’s The Last Days of St. Pierre. Together they cost less than a modern paperback, and I found them far more entertaining. Both books read like novels. For fast-paced excitement, you cannot beat The Day the World Ended, which is a day-by-day account, starting on the 2nd of May 1902 and ending on the 8th , that weaves into this time several strong human interest stories. It was written in 1969, 67 years after the eruption, when the authors could still find a few people close to those times to interview. Zebrowski’s book was written in 2002, and is well researched, with the author spending time in St. Pierre , but is based more on historical documents. It gives a wider perspective, detailing the eruptions that happened later that year, and follows in fascinating detail the voyage of George Kennan, an American who visited Martinique shortly after the eruption and couldn’t wait to climb up and peer into the crater of the very active volcano (it was making load roaring sound), as a terrified populace was still fleeing the area. He also gives more details on the almost simultaneous eruption of St. Vincent’s Soufriere. Both books are based on history, but written to be popular, including invented dialogue and thoughts of their main characters. About 30,000 people died during the eruption, around a sixth of the total population of Martinique at that time. When you think about this history, you have to start by imagining how St. Pierre was at the turn of the century, not as it is now. Agriculture in the richly verdant north end of Martinique had, for many years, been the economic driving force of the island. It had spawned over a dozen millionaire estate owners. By 1902, the profitability was declining, though it was still hugely successful, especially in the production and shipment of rum. 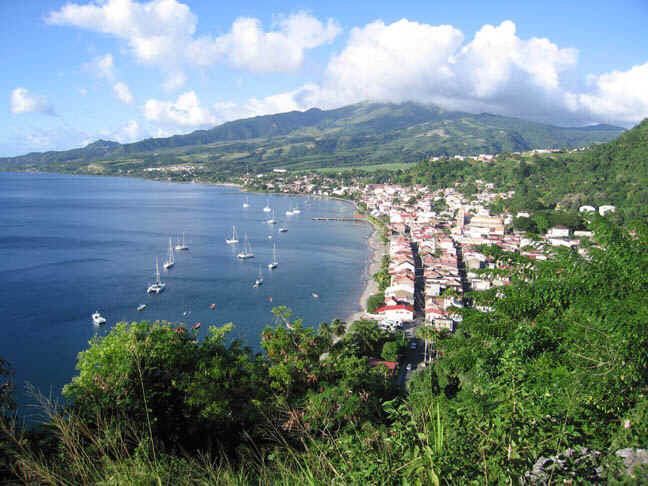 St. Pierre was the largest city in Martinique and one of the largest in the Caribbean . The permanent population was around 26,000 with many more temporary residents coming in to work. By comparison, Fort-de-France , the capital, had a population of about 17,000. Even Precheur, the small town to the north of St. Pierre , had in those days a population of over 5,000, about the current population of St. Pierre today. Many more people lived in estates and villages surrounding St. Pierre than do today. St. Pierre, a busy, alive, and extremely attractive city, had been called the “Paris of the West Indies,” with its theater and grand parties. The main artery for this city was the waterfront; nearly everything and everyone came and went by boat. The road to Fort de France was small and in poor condition. The same was true of the upper road through the mountains. The main and fastest connection was the regular ferry that ran between Fort de France and St. Pierre . By the same token, rum and agricultural products were exported, and consumer goods imported, directly by ship. When people went on vacation or business to France , they sailed on these same ships. As May approached, coming elections had become important to the establishment, as the status quo was being challenged by black politicians. Amadee Knight, a plantation owner, supporter of worker’s rights and education, and a member of the radical party, was already the elected senator representing Martinique in France , and was the first black man to hold this post. The current election was for the French Chamber of Deputies. The first round in a three-way race had resulted in a narrow win for Fernand Clerk. Clerk, a member of the Progressive party, had been selected because he was very liberal for the times, supporting many of the same things as Amadee Knight. It was thought this would give him a chance against the radical party. He was a rich white plantation owner, very much a proper family man and church member, much too straight-laced for most his peers. He was aghast at the prostitution, sailors’ bars, and many other profitable town ventures, and wanted to clean them up. But he was supported by the establishment, which knew he would be easier to deal with than Louis Percin, a radical socialist who was the runner-up. Joseph Lagrosillere, the socialist workers candidate, received the fewest votes and dropped out. A run-off between the two main contenders was slated for Sunday, May 11. A man up to his neck in politics, who would prove quite influential over the course of this history was Andreus Hurard, owner, editor and publisher of Les Colonies, the main newspaper. Hurard was determined that Fernand Clerk should win (although he was not overly fond of him personally), and made it his mission to try to stop the volcano from interfering with the election. The man on whose shoulders the responsibility for the population lay was the Governor, Louis Mouttet. Mottet was self-made man who had married well, a career civil servant who had done his time in less desirable locations, and who regarded Martinique as the place he would like to stay for the rest of his career. He had only arrived five months before the eruption and had a mixed reception. Amadee Knight snubbed him, and considered him of no importance. He found Fernand Clerk rather stiff, and was somewhat put off by his old-money upper-class status. He got on well with Andreus Hurard, who was much more relaxed and had insight into the politics and power of the colony. Had this personal chemistry between the main players been different, it is possible things might have turned out better. Subtle signs of activity started as early as May 1901 and Professor Gaston Landes, at the Lycee in St. Pierre, and the most scientifically educated man on the island, had been watching it through his telescope, recording wisps of smoke. By April the 2nd 1902 , it started belching clouds of steam and smoke, and the surrounding villages were infested with snakes, rodents, and beetles that were driven out of their mountainside habitat. A strong smell of sulfur became pervasive. On April 22nd Landes notes some small earthquakes on his seismoscope, and the main undersea cable line to Guadeloupe broke. On April 23 there was a sizeable eruption, with tremors felt throughout the north end of the island, and when people awoke on April 24, a layer of white ash covered everything. In today’s world this would have been plenty of warning to initiate an evacuation. However, in 1902 little was known about volcanoes. Those in Iceland and the Pacific, which had been the most studied, erupted in a fairly controlled manner, sending out a slow moving stream of red hot lava, which was fairly easily avoided. Although explosive pyroclastic flows of the kind we have in the Caribbean had occurred within human history, they had not been well recorded, studied, or even named. So, at this time, the population was alarmed, but not yet sure how much of a threat this was. After all, 50 years earlier, the volcano had obligingly gone back to sleep; they hoped this would happen again soon. And for while, things seemed to quiet down, until April 28 when several rivers started overflowing their banks, despite a complete lack of rain. On April 30 Landes noted several more earthquakes and there were monstrous flash floods on the river Roxelane and River des Peres, so sudden and severe that several washerwomen were swept away and drowned. But the volcano was still quiet and people hoped that this had released the pressure and marked the end of the activity. May 1st started fine and clear, then there was an eruption, followed by a fall of dust, and all was quiet again. On May 2 there was both an eruption and heavy rain. Zebrowski reports that ash fell so thickly in Precheur that they had to light lamps to see. Thomas and Witts relate that on his day Laveniere, in his estate four miles south of St. Pierre , was swept away in a violent river overflow characterized by a lot of volcanic mud. The volcano erupted with even more force on May 3, with violent earth tremors and bright lightning. Morne Rouge was ankle deep in mud and the priest, Father Mary, had his flock in the church praying. The ash fall reached Fort-de-France and, according to Zebrowski, Mouttet took the regular ferry to St. Pierre and then chartered a small boat to visit Precheur. He found some houses with roofs collapsing under the weight of ash and a panicked population. He did his best to reassure them, promising that, if things got worse, he would evacuate them. He sent a telegram to the Colonial ministry in Paris , alerting them to the eruption. Many people living in outlaying areas under the volcano abandoned their houses and fled to St. Pierre , swelling the population. At this point, Fernand Clerk started his efforts to persuade people that they should evacuate St. Pierre ; that it was crazy to stay. Just after noon on May 3 he assembled 12 of the town’s most influential people and put his case to them. They thought he was mad. Evacuation was insane. How could it be done? Where would people go? Think of the interruption to commerce. In any case, said the detractors, there were enough valleys between the crater and St. Pierre that there was no way for lava to reach the town. Amadee Knight, not wanting to side with his political opponent, went around telling people that the volcano would only quiet down when they voted the white progressive party out of power. That sounds nuts, but when I sat for a week in St. Vincent watching the volcano erupt in 1979, I remember hearing the one of the clergy telling people on a radio program that God sent the volcano because they had not been attending church enough, so people do say these things. Meanwhile Le Colonies had an upbeat special edition written by Hurard which started “Yesterday the people of St. Pierre were treated to a grandiose spectacle in the majesty of the smoking volcano…” He let it be known that he thought there was no risk in the town, but that they should welcome refugees from the hills. He finished by saying that they had to postpone a planned trip to the crater, but would reschedule as soon as possible. On Sunday May 4 people observed hundreds of dead birds. The volcano had been rumbling all night, and ash reached Fort-de-France . Mouttet knew he would have to somehow take the situation in hand. Evacuating St. Pierre would be almost impossible. There were not enough boats to move people out, the road would not take sustained heavy carriage traffic. The healthy could walk out, but they would have to leave everything behind where it would be subject to looting, and there was no way to move the infirm. Fort-de-France , with its population of 17,000, could not accommodate 30,000 refugees; there was nowhere to put them. As a first step, he decided to organize a commission of experts to assess the risk. The committee was quite sanely put together. It included Professor Landes and two other professors, the chief artillery officer who could figure out how far rocks could be thrown, and the head pharmacist who might know of toxic risks. There was only one problem; none of them really knew about volcanoes. At that time, no one did. In St. Pierre’s cathedral that Sunday morning, the acting head of the Catholic church, Monseigneur Gabriel Parel (the bishop was on a retreat in France), announced to the public that the commission was on its way, and that if they had enough faith in God, God would keep them safe. Clerk felt particularly discouraged, the whole world seemed to have gone mad and refused to realize the danger. He had hoped, having failed to rally the civic leaders, the church might help, but to no avail. He decided to get out of St. Pierre with his family and go to his estate in Parnasse. However, when he got home he was met at his house by several friends who were fleeing the volcano and begged to stay with him. He decided to stay for the time being. The influx of refugees was also causing problems with robberies and general unrest. The telegraph cable to Dominica broke. As you sail north out of St. Pierre , a mile or two down the coast, you pass a plant that is mining sand and gravel from the eruptions of 1902. However, in the morning of May 5, 1902 this was the site of a large, prosperous and well maintained rum factory owned by Dr. Auguste Guerin. It was at the mouth of a river called Riviere Blanche. It was a big operation, employing over 200 people, and as the volcano was misbehaving Guerin had been trying to harvest what he could of the sugar crop before it was ruined. The rum factory was working flat out, but he was having problems. Hordes of insects had fled down the mountain and were hindering his operations, the river was flowing so fast spectators had come from town to watch, and he was worried about the volcano. He had booked a passage to send his family to France on the Roraima on May 9. In addition, a friend’s yacht, Le Carbet, was right offshore and he advised his son and daughter in law to be ready to leave on the yacht should anything happen. At the same time this happened, and possibly caused by it, there was tidal wave that swept into St. Pierre . Fernand Clerk, who saw it coming, estimated it to be “nearly 50 feet high and making the noise like the hissing of a million snakes.” Zebrowski, treats this lightly: “The damage to St. Pierre was minimal: one yacht sunk and some cargo on the docks lost” Whereas Thomas and Witts talk of widespread panic, warehouses being ripped from their foundations and splintered, and quite a few deaths, including Emile le Cure, the manager of a major bank, and two of his clerks. Shortly after, he got a cable from his garrison commander in St. Pierre that seemed crazy. He talked about widespread panic, the tidal wave, and the tragedy at the Guerin estate. On May 6 the mayor of St. Pierre had put posters all over town telling people they were not in danger. Mouttet sent provisions by ship to St. Pierre and Precheur, which was now effectively cut off from the rest of the island by the Guerin avalanche that destroyed the road to St. Pierre . Mouttet and members of his Commission visited the spot where the Guerin factory had stood. It is here that things get bizarre. As they stood overlooking the ruins, they decided this did not really change the conclusions of their report. St. Pierre was safe, the avalanche had probably relieved a lot of pressure from the volcano, making it safer. This was wishful speculation. They had not expected the Guerin disaster, and should by now have concluded that they had no idea what might happen. Why did Professor Landes, the most knowledgeable of the group, lend his name to this? Zebrowski creates a scene in his book where he has real doubts, but offers absolutely no evidence for this. Witts and Thomas make a telling point: The 18-page report on an event that was threatening much of the population of the island, devoted fully one third of its contents to the damage to the Botanical Garden in St. Pierre, dear to Landes’s heart. This was a man with his head either in the clouds or buried in the leaves of his precious garden. This is the moment Mouttet needed to act if he was going to save most of the population of St. Pierre. He didn’t. He would have had to use his own common sense and judgment, and gone against his commission, much too risky a proposition for a decent man who was good career civil servant. Had the commission decided differently he probably would have acted differently. But the only person telling him to evacuate was Fernand Clerk, whose judgment he did not particularly trust. For Mouttet, the evacuation of St. Pierre was fraught with danger. There would have been huge dislocation, enormous financial losses, and a massive problem of policing, housing, and feeding a mass of refugees almost twice the population of Ford-de-France. Most of the powerful people in St. Pierre were equally deluded in thinking there was little risk. If he evacuated and nothing happened, it would be the end of his career. It is not surprising that he did nothing. But what about everyone else? People were being told both by the mayor and by Les Colonies they were safe and to stay put. Poor people and refugees did not have a lot of choice. They were getting food here, how would they survive if they moved? Some accounts claim Mouttet posted troops to stop refugees from fleeing south for fear of spreading disease (some kind of pox had broken out), as well as fearing a spreading of theft and disruption. Hundreds of people of means did get out. The ferries were leaving full, and some families chartered boats. But most did not want to leave their businesses and property. On the morning of May 7 the volcano continued to erupt. The final undersea telegraph cable broke. St. Pierre ‘s most important communication link was dead. The captain of the ship Orsolina showed uncommon good sense. He abandoned taking cargo and left against customs orders without clearance. He knew nothing about volcanoes but could see the volcano was dangerous. He was in a minority; about a dozen other ships stayed. That evening Mouttet and his wife arrived. According to Thomas and Witts, the mayor was to put on a huge governor’s ball that night, but when Mouttet saw the state of the town, some of it feet deep in ash, he cancelled it. He had another meeting of his commission and again they assured him St. Pierre was safe. His presence had a calming effect on the population. Sunday, May the 8th was Ascension Day, one of the biggest and most important Church services of the year. Fernand Clerk awoke and started to dress for the service. He heard a strange burping noise from the volcano and went to check the barometer he kept on the balcony. He could not believe his eyes, the needle was oscillating wildly. He aroused everyone in the house and told them to leave at once for Fort de France. He put his wife and four children in a carriage he kept waiting, and fled for his estate in Parnasse. Apart from all the residents, many people had come from Fort-de-France for the church service. Quite a few people approaching St. Pierre from the mountain road stopped when they saw something strange; a wind like a mini-hurricane bent trees and broke branches around the summit. A glowing rock stratum grew around the summit of the volcano. At this point Fernand Clerk arrived at high speed in his carriage. He jumped out and pointed to his barometer – it was stuck, it had broken when he pulled it off the balcony. A big dark cloud covered the mountain and hid the sun. A glowing red ball grew out of the side of Mt. Pelee with a terrifying roar, then slowly detached itself and swept down on St. Pierre . The glowing red ball was a cloud of superheated gas and steam, it set fire and destroyed everything in its path, reducing St. Pierre to rubble, and cremating most people alive. Around 30,000 people died, including Governor Mouttet, Professor Landes, and Andreus Hurard. It moved into the bay destroying the ships at anchor. One steamship, the Roddam, with horribly burnt survivors, managed to limp away. A few survivors were later taken off other burning ships. In town there were two confirmed survivors, a cobbler called Leandre, and the now famous Cyparis. Leandre must have just got really lucky and been in a quieter part of the cloud in the southeastern part of town. He was badly burnt, but unlike all those around him and even those in his house, he survived. Cyparis was in the thick of the cloud, but he was in a heavy stone dungeon two floors down in the police station. It was a few days before he was discovered. According to Thomas and Witts, Cyparis, who was black, had murdered a white man in a drunken brawl and been sentenced to be executed. In their book he was a somewhat central figure, with the governor planning to pardon him just before the election in the hope of helping Fernand Clerk. Zebrowski is much more uncertain about why Cyparis was there, and suggests it may just have just been a drunken brawl, a popular story with tourist histories, though I would think his location, in the only heavy stone dungeon in town, made a conviction of murder much more likely. Zebrowski suggests he may have asked to be there, because he had a fever and it was pleasantly cool. That I find ridiculous. In any event, he was hired by the Barnum and Bailey Circus as an exhibit. Within a year he got drunk again and stabbed and nearly killed one of the other employees, went to jail, and disappeared from view. One of the more interesting and amazing survivor stories is told by Zebrowski. The ferry Diamant had just landed its passengers and was tied to the dock. The ship’s boy, Jean Baptiste Innocent, was on the quay. As he saw the firestorm approach he dived underwater and stayed below as long as he could. While he was under, Diamant’s boiler exploded and it capsized. When he surfaced the whole town was on fire. He clung to a floating plank and was rescued some 7 hours later. The volcano continued to erupt for months. An even worse pyroclastic flow finished off what little there was left of the town. During the eruptions a curious pinnacle formed, sticking hundreds of feet out of the volcano and looking like a monument, it was called the Tower of Pelee, and eventually crumbled. Some years after the eruption, people moved back into St. Pierre and by 1929, when the volcano erupted again, there were a few thousand inhabitants. This time everyone evacuated without question; we live and learn. The eruption was not as bad in 1929, and St. Pierre was mainly spared and continues to thrive. It makes one of the most interesting historical anchorages in the Caribbean. Apart from the ruins, including Cyparis’s dungeon, you can visit the little volcano museum, which was created by Fernand Clerk. I hope some of you will seek out the two books mentioned, both are currently available at a bargain price through Amazon. In them you will find a great wealth of intrigue, politics and romance. History, like science, is based on evidence, but unlike science, replication is not possible, so there is always conjecture. The stories you will read in these books differ and are occasionally contradictory. Thomas and Witts have sections on prison riots, a voodoo uprising, and troops being posted to stop refugees leaving, which are completely missing in Zebrowski. The evidence was probably stories they heard. How true they were, we will never know. Zebrowski is a strong supporter of both Mouttet and Landes, this flavors his narrative. Nowadays the accepted truth is that there was no way anyone could really have known what was to happen, so the disaster was inevitable. But, a minority relied on their gut reaction to what they saw, and got the hell out; they were right. If one of those was governor, would history have been different? If so, was it really inevitable? Since I wrote the above review I came across another account: La Catastrophe by Alwyn Scarth. This is also available from Amazon for a few dollars. It was published in 2002. Whereas the other two authors were journalists, Scarth is an academic (geography) and there is a lot to like in his book. He was more careful with some sources and information, and has a much more academic approach to the background. His sources for population came from the census of July 1901 and are probably much more accurate than the other books. According to these, the population of St. Pierre was 26,011, which corresponds with the other accounts. But his population for Fort de France was much higher at 22,164. He also gave a much better map of salient features in St. Pierre, which gave me a rally good idea where the survivor cobbler Leandre’s house was (I had always wondered). It was close to the center of town, but tucked right back under the hill. His survival was truly amazing. Scarth’s book is also proof that academics can go off the rails at least as much, if not more, than journalists. Take that you lying politician dog! Except it is completely contrary to the very detailed picture painted of Le Clerc in the other books, both of which portray Le Clerc as a man who, while drafted into politics, was not particularly politically ambitious, who was very straight-laced, and who really cared (as much as any planter did) for the working class. The reason for Scarth’s ire is that after the eruption, Le Clerc criticized the now late Mouttet for not considering evacuation, and for doing his best to persuade people to stay put. Scarth wrote: “Fernand Clerc’s own behavior does not stand scrutiny. He himself took no steps to save lives. He had ample opportunity to publish his misgivings in Les Colonies, the editor of which Marius Hurard, was one of his strongest political allies”. According to both other books, Fernand Clerk did his best to start a movement for evacuation and was thoroughly rebuffed. Also according to both other books, while Hurard did support Clerc for the election, he was not overly fond of him, and they were diametrically opposed on the question of the volcano and safety. There is no reason to suppose that Hurard would have published such an opposing view. To me, the contrarians, like Le Clerc, and the captain of Orsolina were the true heroes. It was not that they were irrational or panicky; it was that they took a good look at that mother of an erupting volcano, and decided, quite rightly as it turned out, that it was unsafe. This was not irrational; it was based on millions of years of evolution that allows any one of us to make judgments about safety. This is true common sense. There may be occasions where it makes sense to override these instincts in the face of scientific knowledge. But this clearly was not one of them. Science knew little about volcanoes in those days, and in any case there was no scientist around to lend his voice, just Landes, the science teacher at the high school. I stayed in Blue lagoon and watched a more recent volcano in St. Vincent erupting for about a week. (After each eruption, all of us sailors had to hunker below and close all hatches because of the heavy downfall of ash. It was a big deck clean-up operation between eruptions.) Having read these books I am not sure how smart that was (big surges rolled round into Fort de France on 1902, it could have happened in Blue Lagoon). But one thing I can tell you is that, if I had been anchored a just few miles from the volcano, like St. Pierre was, say in Chateaubelair, there is no way I would have stayed around, no matter who proclaimed it safe.